RYU (Pronounced as re you / r'YOO, the R-sound is halfway between the English R and English L) means "dragon" in Japanese. 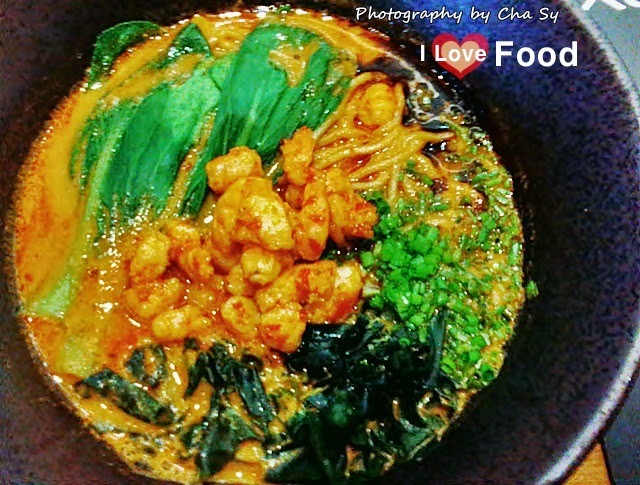 The name came about because all of the five owners of Ryu Ramen And Curry Restaurant (RYU) were born in the year of the dragon. And just like the legendary creature, RYU captures the imagination and gastronomical experience of those who get to enjoy its dishes. The five partners (singer/ comedian Ogie Alcasid, Edwin Dazo, Neil Castillo, DJ Vergel de Dios and Quezon City Councilor Joseph Juico) came up with RYU because they all love Japanese food. They all claim to have a passion for Ramen. Tan tan tan tan... the Tantanmen Five. RYU's latest offering for the Japanese Food lover! The tantanmen, or dandan noodles, is a specialty noodle dish of China and Japan recognized for its red soup, which is known for its incredibly spicy broth. It’s become the unofficial favorite of many in ramen houses in the Philippines, with some variations playing down the heat with the use of peanut sauce. So yummy that you'll end up rubbing your tummy! RYU never scrimps on shrimps in its Ebi Tantanmen. I've never seen so many shrimp bits goodness packed in a single bowl! Ryu's Ebi Tantanmen is so flavorful, especially with its miso-based stock packed with ample serving of vegetables and noodles. The chicken is absolutely heaven! Hefty chicken with shiitake mushroom, vegetables and noodles in a bowlful of miso-based broth. Yaki Buta, Gyu, Ebi, Karaage, or Classic? Which of the #Tantanmen5 is your favorite? Katsu + Cheese + Curry + Rice = Happy and satisfied Tummy! We also tried its Katsucheese Curry and boy was I happy that I tried it! It is so yummylicious! The cheese is oozing and its flavor is so good! Just like me, you'll be a convert and would be wanting for more. Cap off your weekend with a savory bowl of its Yaki Buta Tantanmen! Try this and all the #Tantanmen5 at your favorite ramen place #ryuramenandcurry #smjazz #smdcjazz #jazzmall #jazz #jupiter #reposo #makati #ryutantanmen #tantanmen. For a Php280 Tantanmen, RYU Ramen is certainly cheap for a ramen place. Tantanmen 5 are all delicious and they did not disappoint. Though I am a bicolana I can't eat extra spicy ramen. It is good to know that in RYU Restaurants you could request the chef to tone down the spiciness of its Tantanmen. Ika nga, have everything in moderation. Its serving size is quite big. In fact, a group of four to six persons could share one big bowl of tantanmen ramen. So, price wise, its tantanmen 5 ramen are all worth your hard-earned peso. Tamanegi is fried vegetable that can lessen the spiciness level of your Tantanmen, making you crave for more ramen! 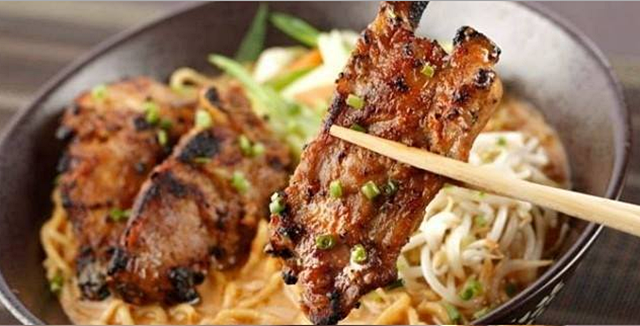 Affordable yet huge ramen servings that will surely leave you with a full belly. That's the RYU Ramen's promise. 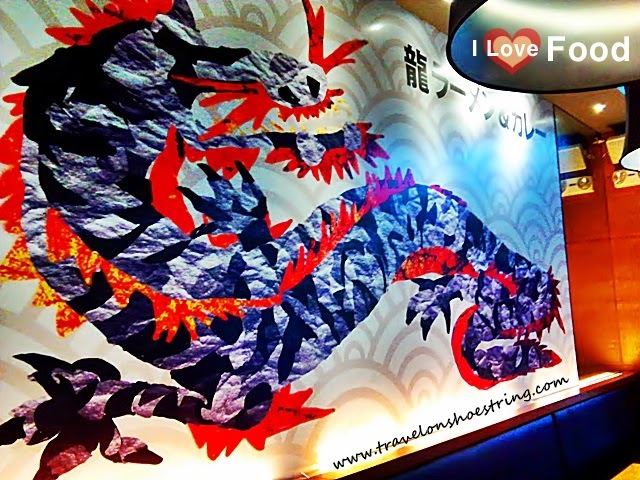 Ryu's wall is decorated with a Japanese Dragon Drawing. This review is made possible by Open rice ph. #ead6 Thank you for the invitation, Heidie. WOW! You ate a lot Ms. Cha! Your pictures are so nice and I felt so hungry just by looking at them. Me and my wife like Japanese food and we would definitely try this one. thanks a lot! Thanks for reading and for leaving a comment on my blog post @Colymd. You and your wife will definitely enjoy Ryu's food offerings. your blog makes me want to try it. You should try it sir Rannie!